Coinciding with the 20th anniversary of liberation (Kwibohora 20) following the Rwanda genocide of 1994, the 2nd International Conference on Democratic Governance in Africa, Asia and the Middle East was organized in Kigali, Rwanda and held June 30-July 2. 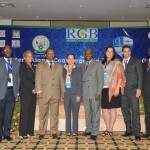 Organized by the Rwanda Governance Board (RGB) and Cheyney University of Pennsylvania, the conference was a key event to promote knowledge exchange and awareness about development strategies evolving from local administrators and stakeholders. Several ASPA members, including ASPA vice president Susan Gooden and Gedeon Mudacumura, chair of the Section on International and Comparative Administration. There is general consensus within the international development community that development strategies prescribed to developing countries have failed to achieve their intended goals. This second conference provided an opportunity for scholars, practitioners, policymakers and key development stakeholders to learn about specific “home-grown” initiatives implemented in various parts of the world. Key conference partners included ONE UN/Rwanda, United Nations Development Programme (UNDP), and the Levy Mwanawasa Regional Centre for Democracy & Good Governance (LRMC). More than 257 individuals from 28 countries, representing four continents, participated. The 56 presentations were organized around the conference theme: Accountability and Youth Engagement for Sustainable Development. Focus areas of the conference included worldwide home-grown initiatives for democracy and development; identity and political culture in building sustainable development; citizen participation in democratic governance processes; democratic governance and integrity; public and private institutions and democratic governance; democratic governance and sustainable development; democratic process in Africa, Asia, and the Middle East; governance networks and democracy; measuring governance and democracy in Africa; and young researchers and promotion of democratic governance. In addition to the conference event, pre-conference sessions, designed to foster country wide engagement were held at 14 universities and institutes of higher learning throughout Rwanda including Kigali City, Southern Province, Northern Province, Western Province, and Eastern Province. These sessions provided an opportunity for university students and academicians to reflect on issues concerning governance and development while identifying strategic options for strengthening democratic institutions and improving public service delivery to the citizenry. Photo (left to right) (asterisk denotes ASPA member): Justine Mbabazi Niyibizi, Vice Rector of Administration and Finance, Institut Polytechnique de Byumba; Felilcien Usengumukiza, Deputy Chief Executive Officer, Rwanda Governance Board; Sheilah Vance, Chief of Staff and Deputy to the President at Cheney University; Anastase Shyaka, Chief Executive Officer, Rwanda Governance Board; Susan Gooden*, ASPA Vice-President and Professor, Virginia Commonwealth University; Gedeon Mudacumura*, SICA chair, COMPA president and Associate Professor, Cheney University; Tina Nabatchi*, Associate Professor, Syracuse University; Marco Ferreira*, Coordinator of Graduate Programs, Federal University of Vicosa (Brazil); and Theodore Mutabazi, Head of Civil Society and Political Parties, Rwanda Governance Board.